When the history books are written, I predict that my father will finally be awarded the recognition he deserves as a spectacular medical con man and master media manipulator. As I told the LA Weekly, "My father is such a brilliant promoter, he could teach P.T. Barnum a few tricks." But last week the master may have gone too far. Less than 24 hours later, the headline and the article were substantially rewritten. When he heard that a resident was choking, Perry Gaines, maître d’ for the Deupree House dining room, ran toward the table. ...When Gaines arrived at the table, Dr. Henry Heimlich, a 96-year-old resident of the Deupree House who invented the famous technique for clearing a blocked airway, was standing behind the woman, ready to perform it. Heimlich, who swims and exercises regularly, was able to dislodge a piece of hamburger that had become stuck in 87-year-old Patty Ris’s airway. ...Monday’s incident at the Deupree House was the first time Heimlich...used it to stop someone from choking, he said. Not according to what my father told these four reporters in articles from 2001 through 2006. But despite being the inventor of one of the most significant medical techniques, Dr Heimlich told BBC News Online that he has only been called upon once to carry it out himself - and that was just three years ago. "I was in this club restaurant eating when I heard someone calling Dr Heimlich. I turned around and saw a man choking so I did the Heimlich Manoeuvre and got it out and then went on and had my lunch." 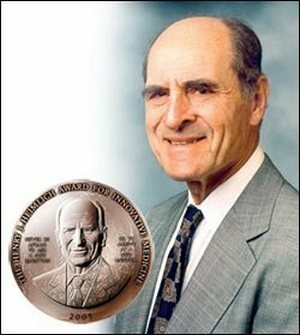 Twenty-six years after inventing the Heimlich maneuver, Dr. Henry Heimlich finally had an opportunity to try it himself. Heimlich was having lunch last year when he was urgently called to the side of a man choking on his food. Heimlich wrapped his arms around the man and made a fist against his upper abdomen. He thrust upward and out popped the food. Another life saved. "I just did it and went back to eating," Heimlich said. Heimlich said anyone could have done it. ...The New Yorker interview was only a decade ago and although my father's getting up there in years, knowing his keen memory, I'd be surprised if he would have completely forgotten the incident. Also, this morning you wrote me that my brother Phil Heimlich told you that this was the first time my father ever revived a choking victim using "the Heimlich." As you may know, as longtime vice president of the Heimlich Institute, my brother has a close professional as well as personal relationship with my father and has always lived in Cincinnati. Frankly, it doesn't make sense that Phil would be unaware of my father's choking rescue at the Banker's Club. Coincidentally, according to this website, this Wednesday June 1 is "National Heimlich Maneuver Day": http://www.nationaldaycalendar.com/days-2/national-heimlich-maneuver-day-june-1/ Did my father, Phil, or anyone else mention that to you? We will be updating our story before long. Thank you for sharing this information with us. Mr. Grasha is out of the office for several days. Please refrain from emailing him over the holiday weekend. Monday might not have been the first time Dr. Henry Heimlich performed his namesake medical procedure on a live choking victim. ...Heimlich told The Enquirer Thursday his encounter with Patty Ris at the Deupree House senior living facility, where they both live, was the first time he ever performed it on a person needing immediate aid. However, several published reports in the early 2000s from news outlets ranging from the BBC to the Chicago Sun-Times show interviews with Heimlich describing himself using the maneuver. In one interview, he said he helped a man at the former private dining club, the Banker's Club, in Downtown Cincinnati in 2001. ...Cincinnati.com initially published a story late Thursday about the incident, quoting Heimlich as saying this was the first time he'd ever performed his own maneuver on someone. But then one of his sons, Peter Heimlich, reached out to media organizations pointing out the existence of articles roughly 15 years ago. Another son, local attorney Phil Heimlich, said he doesn't recall those media reports. This video clip may be the reason why. ...It isn't the first time Heimlich's statements have been challenged. In 2003, The Enquirer reported that Romanian surgeon Dr. Dan Gavriliu disputed statements from the Cincinnati doctor that he developed an operation that uses a section of the stomach to bypass the esophagus. The Romanian doctor claimed Heimlich took credit for a procedure he developed years earlier. Click here to download a copy of the book. My father included no mention of his alleged 2001 Banker's Club choking rescue. In other words, my father punk'd the Enquirer, my brother Phil, and Episcopal Retirement Services. My father may not be the master scammer he used to be -- the Banker's Club turned out to be an exploding cigar -- but that's not too shabby for a 96-year-old. Big hat tip to McKinight's editor James M. Berklan for his lively column today, This lifesaving coincidence definitely makes you swallow deeply, which steered me to the ERS promo kit. 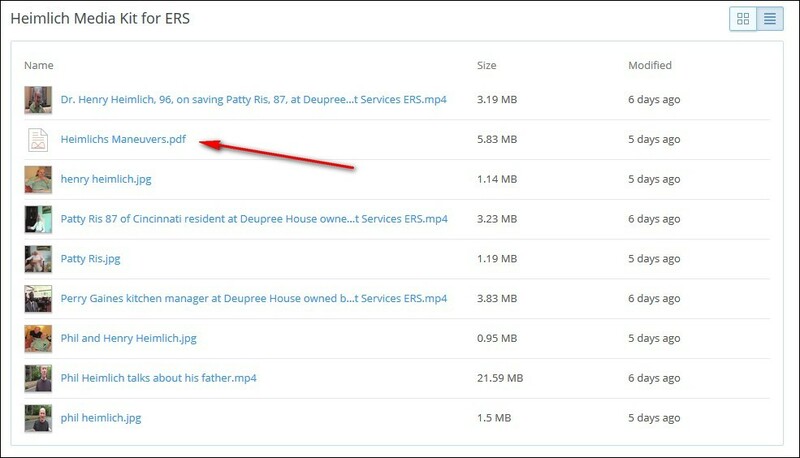 Don't miss reading his skeptical review of the Deupree House event, today's National Heimlich Maneuver Day festivities, and my brother Phil's involvement. My favorite line? A better-timed rescue P.T. Barnum couldn't have orchestrated.